After rescuing the DC movie-verse from rampant mediocrity, Wonder Woman deserves much more than the basic Barbie treatment. 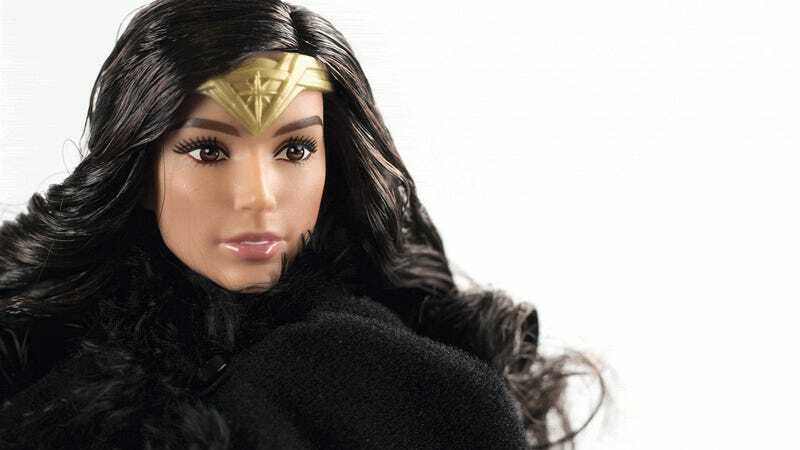 The Black Label Wonder Woman Barbie collection features articulated bodies, stunning face sculpts, amazing outfits and awesome accessories. They’ll do nicely. When most people think of Barbie dolls they think of the $15 to $20 fashion dolls sitting on the shelves at their local Walmart. But there’s an entirely different side to Barbie aimed at the brand’s most passionate fans. Browse the Barbie Collection website and you’ll find everything from modestly-priced exclusive fashion dolls to $200 models sporting Oscar De La Renta designs. You’ll also find these three. 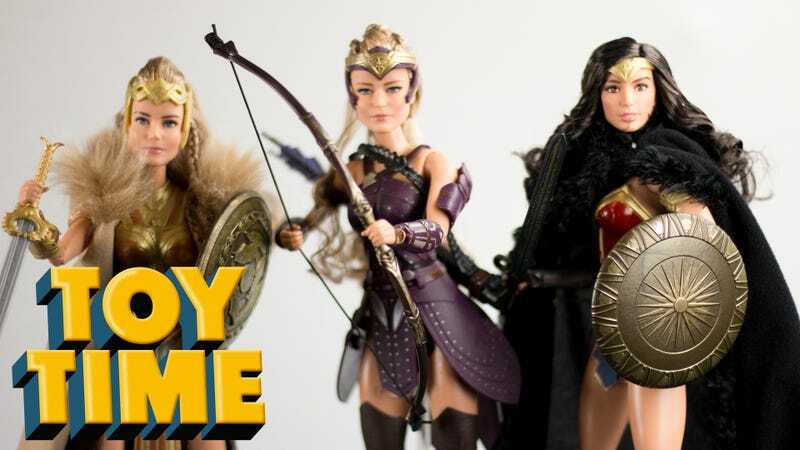 Priced at $44.95, the Black Label Wonder Woman collection features dolls that straddle the line between “for play” and “for display.” Hippolyta, Antiope and Diana look good enough in their boxes or on stands on a shelf, but the weapons, armor and accessories beg to be fiddled with. If I still had my G.I. Joe collection from when I was a kid, I guarantee you I’d be recreating the crossing no-man’s land scene from the movie with Wonder Woman facing off against the tiny forces of Cobra. But the collector in me wants to keep these three in good condition. Each doll is packaged with a certificate of authenticity, and it’s hard to bring a toy with such pedigree out into the backyard to ride around on Tonka trucks. Each doll also comes packaged with a stand, which you’ll need if you want their tiny feet to stay on the ground. Let’s start with my favorite character from the movie, Robin Wright’s Antiope. While Gal Godot gets top billing, Wright dominated the early moments of the movie with her presence and physical prowess. This is a very good likeness. While she does sport Barbie’s signature super-long neck, she’s also got Robin Wright’s face, which makes the neck much less important. Since Antiope is the only doll of the three not sporting a cloak or cape of some kind, she’s the best one to showcase some of the line’s cooler features. Like the removable armor. Or the articulation. While still unable to swivel at the waist or move their feet, these dolls are still more poseable than most anything else in the Barbie lines. Legs swivel at the hips, arms at the shoulders. Legs and arms both bend and hands can rotate in their sockets. And the hair. Man, the hair on these is spectacular. Plaits, braids, curls—just don’t let anyone get near them with a doll brush, because there’s no going back once these intricate weaves are unraveled. My favorite feature of Antiope has to be the bow. The plastic bends as the string is pulled back, making for some dramatic posing. Sadly the arrows seem to be stuck in the quiver, but there’s only so much those tiny doll hands can get done. Next up is the queen of the Amazons herself, Hippolyta. Look at that damn fur-trimmed cloak. Just look at it. Did you notice the braid? The braid is amazing. Really sets off that bronze armor. While not quite as spot-on as Antiope, Hippolyta’s face is a fair approximation of Danish actress Connie Nielsen. I would have liked to have seen a sterner expression, but the Barbie folks aren’t big on folks popping off their dolls’ heads and swapping them out. Let’s just imagine Diana wasn’t feeling rebellious or curious the day this sculpt was made. Why would she be carrying a sword and shield, then? Maybe they were gifts. I don’t know. It’s not a deal-breaker, but this is a race of battle-ready warriors, sporting some very detailed weapons. Battle-ready faces would have really been cool here. But I get it. These are dolls. Dolls need to be more approachable than action figures. They need great hair and oh my god look at this cloak. Or better yet, look at this cloak. The star of the line, Wonder Woman gets the coolest clothes of the lot. This cloak, cape, whatever you want to call it, is one of the coolest bits of clothing I’ve seen on a toy. One moment she’s completely concealed . . .
. . . the next she’s drawn her sword, raised her shield and has the Lasso of Truth at the ready, just in case. Here’s Mattel’s full-body product shot, which really doesn’t do Diana justice. Especially around the face. In the product shot the sculpt looks more generic. Close up, it looks like Gal Godot. The cloak, as with Hippolyta’s cape, is removable. But really, why? The cloak is such a good look. The Black Label Wonder Woman Barbie collection dolls are available now in stores or at The Barbie Collection website, where all three are bundled together for $120. While you’re there, check out the special Steve Trevor and Diana Paradise Island gift set. Or maybe don’t. Can’t all be winners, Steve.